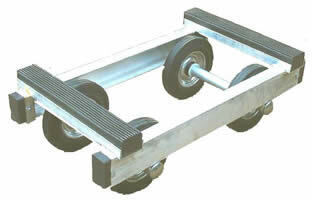 This Alan Stuart Aluminium Piano Truck specially designed for easy and safe movement of pianos and other heavy objects. The piano truck/trolley is unique in that it is an all welded construction. Because the piano truck/trolley is welded throughout there are no bolts or split pins used, making the truck extremely strong and rigid. Non-marking rubber buffers are fitted on each corner of the trolley and ribbed non-slip rubber blocks are fitted on the top channel. For more information on Aluminium Piano Trucks, Heavy Duty Piano Skids or Piano Furniture Removal products then please contact us.